The T-375 Tabletop Roll Bagger automatically prints, feeds, seals, and tears-off pre-formed bags on a roll and will allow you to achieve MUCH HIGHER packaging rates than you get with an impulse bar sealer or zip lock bags and manually applied labels! 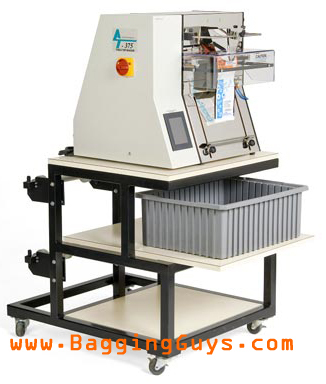 The T-375 includes the ability to AUTOMATICALLY PRINTS each bag just prior to opening it! Digital controls for Auto (Paced Rate) or Manual (Foot-switch or Guard-Switch) cycle operation. Total Cycle Counter with Reset, Seal Time, Fill Time Delay and Seal Point. Set points are saved and automatically recalled when power is shut off. If you don't need to print, you may be more interested in the T-300 Tabletop Bagger. Click here for T-300 details! Teflon only contacts the heater bar while sealing! Patented anti-jamming method detects seal obstructions and reverses seal bar. Handheld Bar Code Scanner Package - Reads data-to-print from your Packing Slip! 2" x 2" up to 11" x 16"
19.5" x 16" x 21.5"
our T-1000 Advanced Poly Bagger! !